The Northern Virginia Walk is held annually at the Reston Town Center. TeraThink folks arrived a little before 1:30 pm and the town center was already packed! Sponsors lined the streets with tables full of insightful information; there was even a fun table for face painting (a hit for all the kids!). Prior to the Promise Garden ceremony, participants chose flowers of different colors to represent their connection to the disease. It was a powerful moment to see people raise their flowers in the air before the start of the walk. 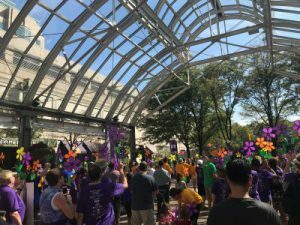 The fundraising goal for the Northern Virginia Walk was $250,000. I am proud to say TeraThink helped the chapter exceed that goal! The walk raised over $273,000! Overall, it was great to see the community so involved in such an important cause. 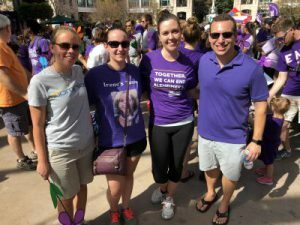 2017 marked the first year we had an official TeraThink Team for the walk, but we look forward to helping raise awareness for this worthy cause for years to come!